In a campaign eerily similar to that of Jonathan Gruber – the MIT professor caught on tape admitting that it was necessary to mislead and deceive voters about ObamaCare due to “the stupidity of the American voter” – Nevada Gov. Brian Sandoval is now pushing a billion dollar tax hike despite unmistakable and undeniable campaign promises to the contrary. Yes, that was Sandoval who underlined the words “without raising taxes,” not me. He then got elected…and raised taxes in 2011 by over $600 million. And then did it again in 2013. This was a reference to a proposal – the Tax and Spend Control (TASC) initiative – originally pushed forward by former conservative State Sen. Bob Beers in 2006. Sandoval got elected…and hasn’t done a thing to impose spending caps to rein in government spending. But this month the governor proposed a new $440 million tax on Nevada corporations that will be based on…the income of the corporations! Sandoval promised to “Reduce Government Bureaucracy,” claiming to be a “true conservative who believes limited government is the best government.” Yet under his watch, government bureaucracy has continued to expand, not retract. “Not ever” turned out to be a very short time. Yet he dilly-dallied and waffled back and forth on whether or not to sign a gun control bill in the last session and never lifted a finger to help pass the Amanda Collins Law to allow conceal-carry permit holders to carry their weapons for self-defense on campus. Now, I personally disagree with the governor on this issue. Nevertheless, he did make that promise. But when it came time to fight a court decision overturning Nevada’s constitutional ban on gay marriage, the governor quit the fight. It might have been the right thing to do, but it was nevertheless another broken promise. But in addition to breaking all manner of campaign promises – including support for school vouchers – he ran for re-election last year and hid from voters his intent to sock us all with a billion tax hike. Until that time, Malone was considered squeaky-clean. He was a former Metro police officer with pretty hair and a sunny smile. A few years later, Malone went to jail for seemingly unrelated reasons. But if a man’s word in no good; if he fails to honor the promises he makes as a political candidate, it should come as no surprise when that lack of honesty and integrity creeps into other aspects of his life. 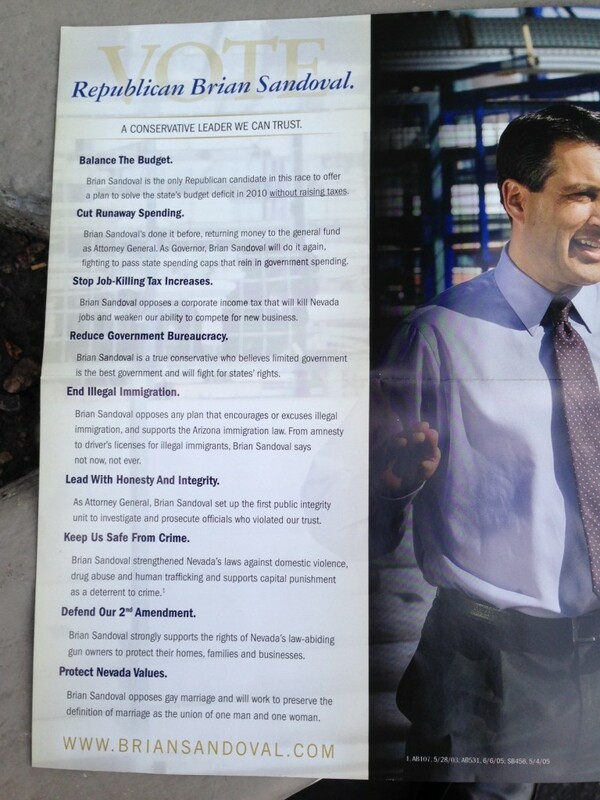 And just as voters eventually discovered with Lance Malone, you also just can’t trust Brian Sandoval.